Despite increased adoption of renewable energy sources, market analysis clearly shows oil, gas and petrochemicals will dominate the energy landscape for years to come. Even as we work to decrease carbon emissions and create a green energy future through electric vehicles (EVs) and renewables, worldwide dependence on Oil & Gas (O&G) is expected to remain high for the foreseeable future. Research indicates increasing investments in renewables and electric vehicles will yield measurable change to the energy distribution landscape, but not for another 20+ years. Meanwhile, O&G companies are faced with producing energy for today’s demand while creating cleaner energy products for the future. Added to that, O&G companies are challenged to adopt more sustainable operations to improve efficiency and profitability. Converged systems: By connecting various processes, O&G operators can gain visibility throughout the production life cycle, removing silos and enabling greater clarity into process functions, workflow, and equipment issues. Predictive analytics: Data analytics helps monitor equipment behavior and spot or avoid issues before they occur. For example, predictive analytics at the edge can warn operators of a failure in rod pump operation well in advance allowing maintenance teams to plan site activity and reduce unscheduled downtime. Maintenance optimization: Workflow applications automate the generation of work orders to be issued for maintenance, which ensure there is no production loss. Digital Twin: Leveraging digital twin technology creates a model of a plant or asset to simulate performance even before it´s built, resulting in better profitability and safety, from initial design to asset performance management. With social and political pressure driving sustainability, O&G companies have prioritized the shift toward sustainable operations. Through innovation and digitalization, the O&G industry is making great progress in sustainability. In addition to investments in renewable energy sources, there are many ways in which IIoT and digitalization strategies can support sustainability. Enabling greater visibility across the organization’s energy consumption is an important strategy to support energy efficiency. Energy management and control systems enable O&G operators to monitor real-time energy consumption, power quality and system health in their operations. By focusing on smarter energy use, O&G companies can optimize energy consumption, extend the life of critical equipment, reduce risk of failure and protect workers. Shifting to gas is one initiative towards reducing carbon emissions and making our environment more sustainable. Floating LNG regassification plants and gas based power plants have gained major traction in past few years in some remote geographies. IIoT solutions for FLNG plants can also help improving efficiency and increasing profitability. Key processes within Oil & Gas and Petrochemicals operations have reached a new level of digitalization, driving significant efficiency and productivity advantages for an industry in the midst of a major paradigm shift. O&G companies must continue to invest in digital innovation to successfully evolve along with a world increasingly focused on sustainability and energy transparency. Schneider Electric is leading the digital transformation of energy management and automation. 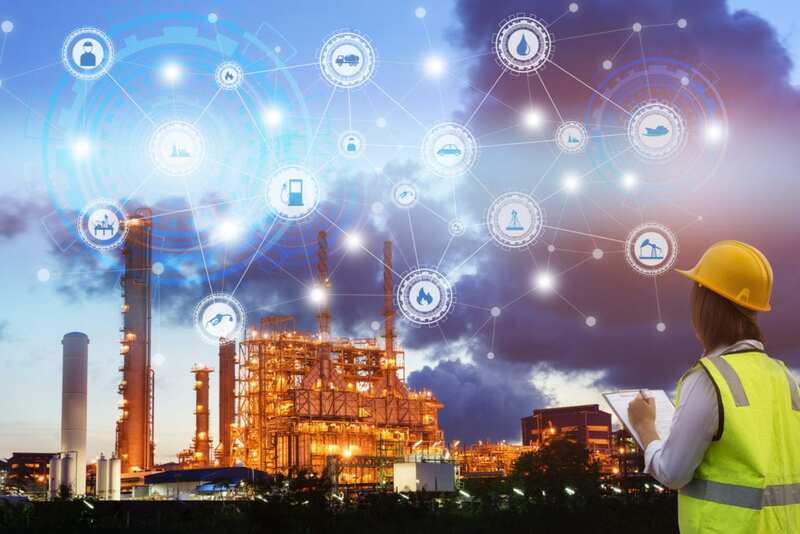 Using IoT-enabled solutions to seamlessly connect, collect, analyze, and act on data in real-time, which can deliver enhanced safety, efficiency, reliability, and sustainability performance of major industries, including O&G.